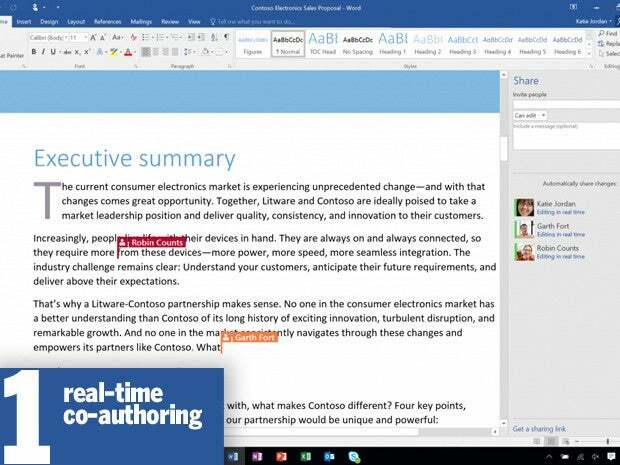 Collaboration is the key to Microsoft's still-ubiquitous productivity suite. 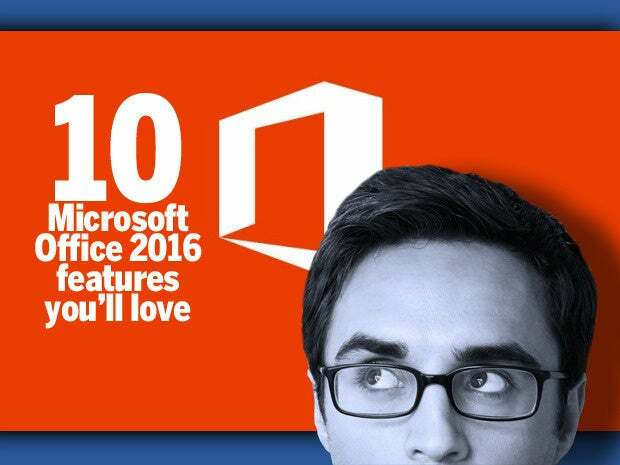 To the casual user, the applications that make up Office 2016 -- Word, Excel, PowerPoint, and Outlook are the anchor tenants, of course, rounded out by OneNote, Access and Publisher -- will be indistinguishable from their predecessors. 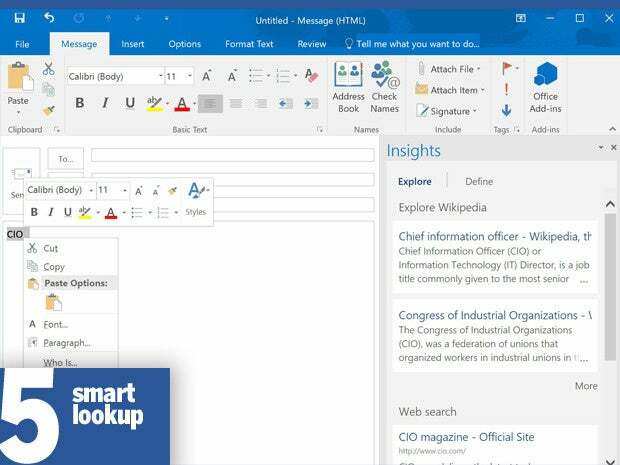 But make no mistake about it; Microsoft’s reboot of its flagship software suite is a major update, offering a wealth of collaboration capabilities that integrate more tightly with SharePoint and OneDrive than before. The many tweaks and enhancements across the board can be confusing, though, so we peek under the hood to highlight the features that matter most. 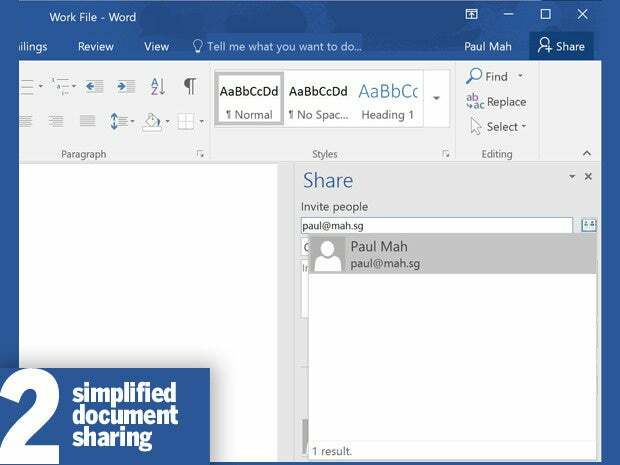 You can now easily share your documents in Office 2016, courtesy of a prominent “Share” button in the Ribbon. 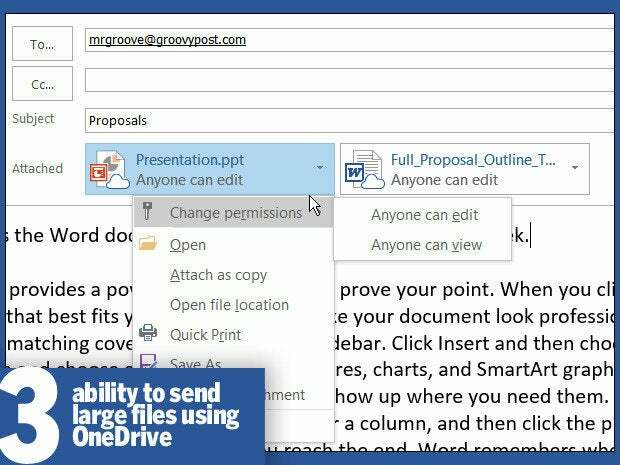 Available across Word, Excel, and PowerPoint, the Share button lets you share access to a document to your team members, and it serves as a one-stop location to review access permissions or see who is currently working on the document. As with co-authoring, the files must be saved in either SharePoint or OneDrive in order to be shared. Made a mistake while editing a document or accidentally deleted a chunk of content some time back and only just realized it? For files saved on SharePoint and OneDrive for Business (This doesn’t work for OneDrive at the moment), Office 2016 allows you to view historical versions of Office files directly from within Word, Excel and PowerPoint. Simply go to File > History to see a list of all prior versions in the History pane, click on the desired version, and load it in a separate window. The feature is also useful for reviewing earlier drafts of documents when editing a file or collaborating with others. 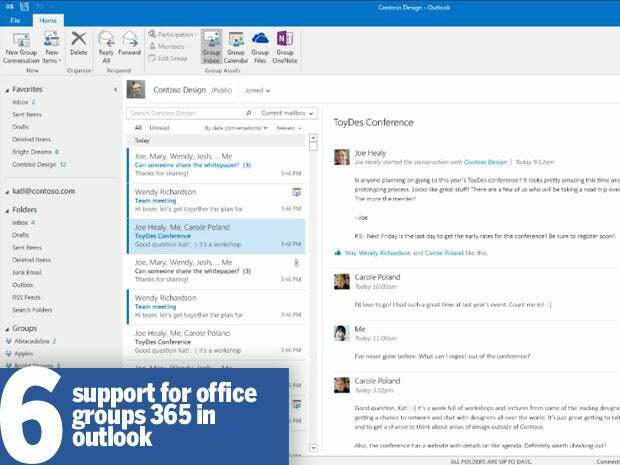 A new feature called Groups in Outlook 2016 was quietly added with the launch of Office 2016. 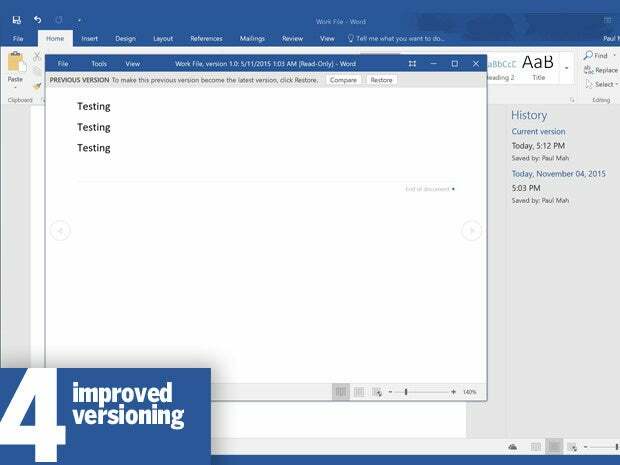 While relatively little mention was made of it, the new tool essentially offers a superior way to eliminate traditional distribution lists or messy email chains for collaboration within teams and project groups – both at work or at home. Essentially, you can create a group for new colleagues or friends to join, with each group having its own shared inbox, calendar, file repository, and even integrated OneNote notes. One of the tighter integration that Office 2016 offers is how the various desktop apps now let users jump into a Skype call from within Word of Excel. Tap into the various capabilities in Skype such as IM, voice, or video calls, as well as screen sharing without having to break out of your current workflow or to launch the Skype client.